Today is the day I'm off on a jet plane and going on my holiday! Yay! After annoying veryone for 9 months it is finally time for us to leave! Along with a holiday comes packing... and as much as I like to think I'm good at it ... I'm really really not! It's not just my suitcase I seem to overpack but I have always seemed to find space for the randomest things in my hand luggage. Saying this, this time I feel like I done quite well to be strict when packing my hand luggage! 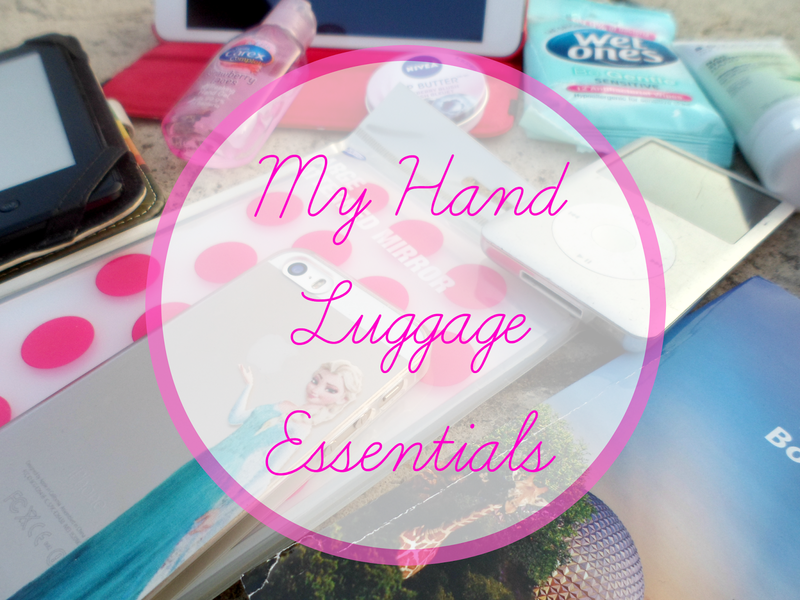 So I was thinking that today on A Yellow Brick Blog I'd show you some of my favourite essentials that I've popped in my backpack. Keep your eyes peeled here on the blog as even though I've popped away for a little while it will still be live and kicking for you all to read and hopefully enjoy! First up - the apple shrine. Yup, my iPad mini, iPod & my iPhone. I couldn't leave the country without these little connections to the outside word, is it sad that they a like an extra limb? I'm looking forward to having my iPad for the plane journey, hopefully with that, the in-flight entertainment and my kindle I'll be able to keep myself entertained! A little bit of reading material to get me super duper excited? Why yes I have that covered! The Little Book Of MAgic has anything and everything you need to know about Disney in it! I think I'll be doing alot of planning with this thing! Plus my Tangle Teezer.... I can't go anywhere with this hair saftey blanket! My kindle is my little baby, like carrying around a mini library with me 24/7! I'm currently reading the Vampire Academy series so I'm hoping t get in lots of reading time whilst away! A few beauty essentials now. 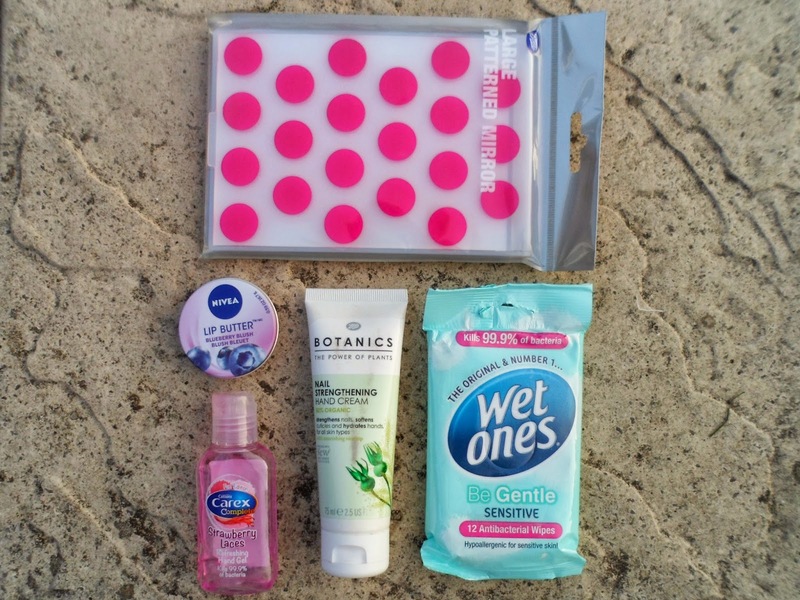 I couldn't be a so-called 'beauty blogger' and not have some form of girly products in this post could I? 1. Mirror, obvious really, a great size to take with you, especially as our hotel probably won't have them in helpful places! 2. Lip butter, you can't travel, go on a plane or even really leave the house without having a lip product with you! My skin and lips sometimes feel really dry and thirsty when flying so keeping them hydrated is key! 3. Anti-Bac... public transport is dirty with a capital D, this make me slightly more comfortable with it! 4. Hand cream is a lovely little pick me up I like having in my bag and it's under 100ml so perfect as a backpack item! 5. Wet ones... I don't know why I feel the need to have these, but I do. I am so bad at over packing - especially makeup and skincare stuff. Like I need 8 different lipstick options for 3 days away...but a girls gotta have choice (I mostly wore lip balm the whole time!!). I think I want to try that Botanics hand cream! I hope you have a great time! I'm exactly the same when it comes to packing! That phone case is EVERYTHINGGGG! I really love that phone case - all of your things are so cute. Hope you have a great time.